Hahnville softball teammates Karly Taranto and Courtney Ortego enjoy the moment on their signing day. The second wave of St. Charles Parish collegiate signees was an impressive one, as 15 athletes from Destrehan and Hahnville High Schools put pen to paper at the annual spring Signing Day ceremony at the Satellite Center. 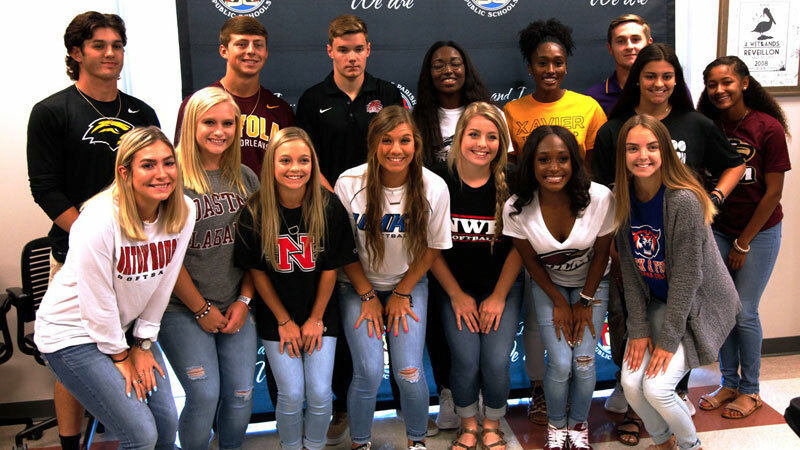 The 15 signees were a well-rounded group spanning five different sports, but all of them shared two commonalities: exceptional high school careers and the chance their hard work has afforded them to earn scholarships toward continuing their education and athletic pursuits. 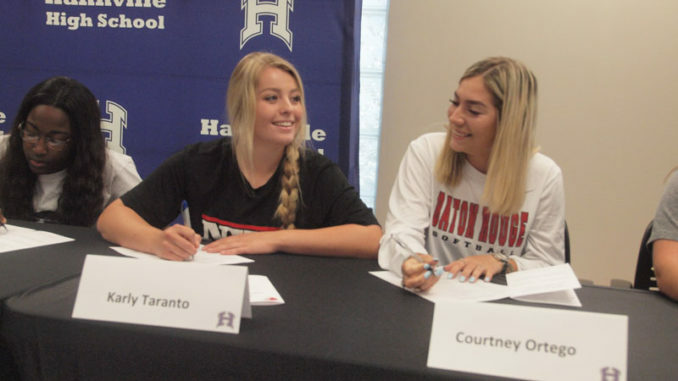 Keller signed with Coastal Alabama University, while Tiger teammates Danielle Duplay (Nicholls State), Catherine Friloux (Missouri-Kansas City), Courtney Ortego (Baton Rouge Community College) and Karly Taranto (Northwest Florida State) are each headed their own separate ways. “Everyone that supported us through our whole journey came out today, and it’s so special for us to see them and for them to see us all together this last time,” Keller said. Meanwhile, the collegiate destination for Destrehan’s Landon Marceaux has long been known, as the top recruit and right-handed pitcher committed to LSU early in his prep baseball career. Whether he makes it to the school is not as clear, though, but for a very good reason: Marceaux is expected to be drafted by a major league baseball team, and where he’s selected and how the ensuing negotiations go in that process will likely go far in determining whether he ultimately decides to don the purple and gold or go pro. Either way, Marceaux said he could appreciate the moment on signing day. 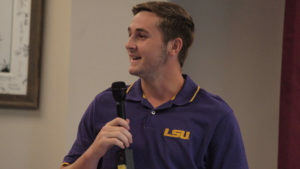 Marceaux said he’ll fondly recall all the big games he was able to pitch in and share with his teammates, noting a dramatic first round playoff win over Denham Springs in his sophomore season and the many showdowns with archrival Hahnville among his favorite memories. 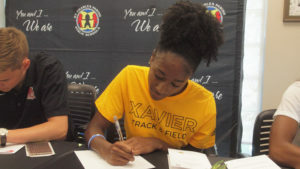 Hahnville track and field standout Ashlyn Jack, meanwhile, signed with the University of Louisiana-Monroe fresh off of landing an individual runner-up medal in the Class 5A 300 meter hurdles event and two others for helping spur the 4×200 and 4×400 relay teams to two more second place finishes. She said she loved the environment at ULM, as well as the coaching staff. Jack’s teammates Kayli Farmer (Louisiana College) and Alexis Williams (Xavier) also signed on the dotted line, as did Destrehan track star Jala Richard (Louisiana-Monroe). Hahnville baseball players Matt Champagne and Hunter LeBlanc are headed to Loyola-New Orleans and Southern Mississippi, respectively. Hahnville swimmer Earle “Jay” Madden is headed to Loyola-New Orleans. Destrehan softball player Grace Estevez will go on to play at Colorado Northwestern Community College, while Hahnville basketball standout Makaila Carter signed with East Baton Rouge Community College.